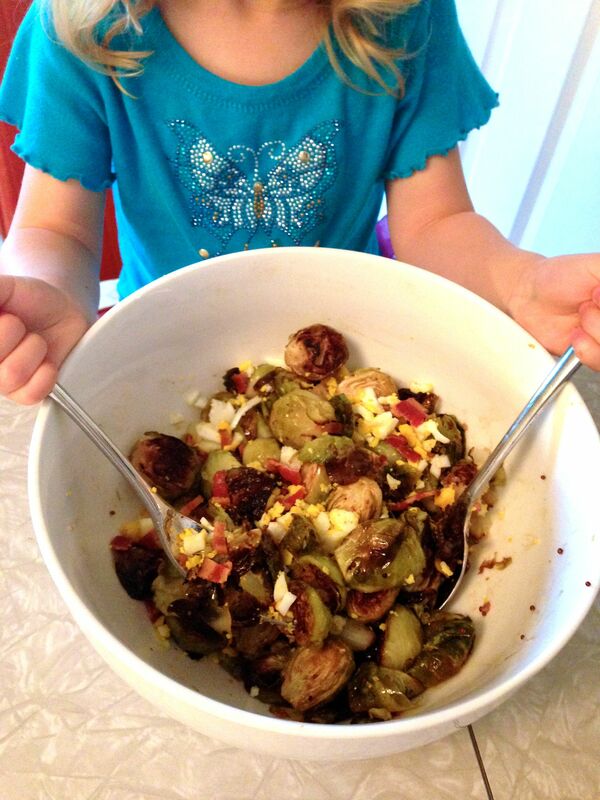 How do you get kids to eat and like Brussels Sprouts? Let your kids help cook them! Little Bird has enjoyed cooking since she was a baby. Last night was no exception. Together we tried out a recipe from the Nom Nom Paleo book that was featured on the Good Food Blog, “Cavolini Al Forno,” a warm Brussels Sprouts salad with a mustard vinaigrette, topped with prosciutto crisps (we used bacon) and crumbled egg. You can find the full, delicious recipe here. The only substitution we made was bacon for the crispy prosciutto. Basically, she did everything but the knife skills and taking things in and out of the oven. To me it is just common sense: kids enjoy eating things they make! Her Papa loved the dish, too, and she just shone watching him enjoy it. Making Cheese with Kids — Chèvre is fun to make, like a science project. Making Cheese with Kids Part Two — Kids love rolling and shaping logs and adding their favorite toppings, like cranberries. 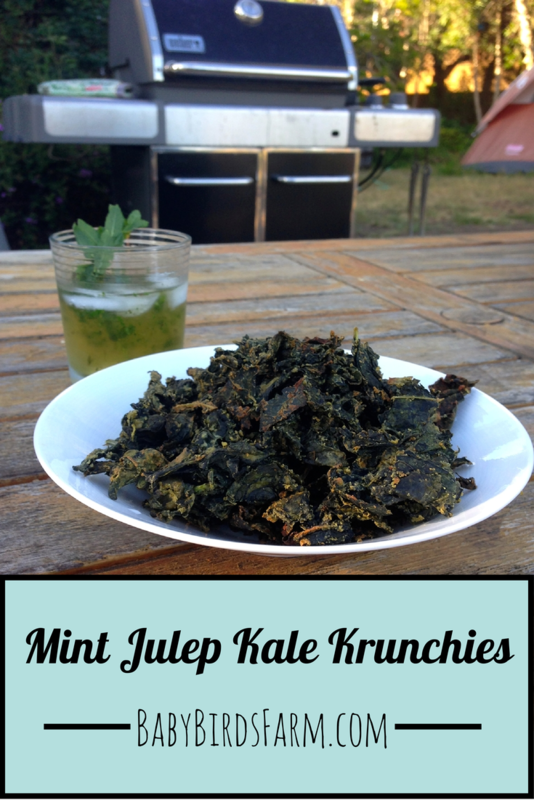 Easy Homemade Kale Chips “Kale Crunchies” — Another great way to get greens in their diet, Plus who doesn’t enjoy shaking the bag? 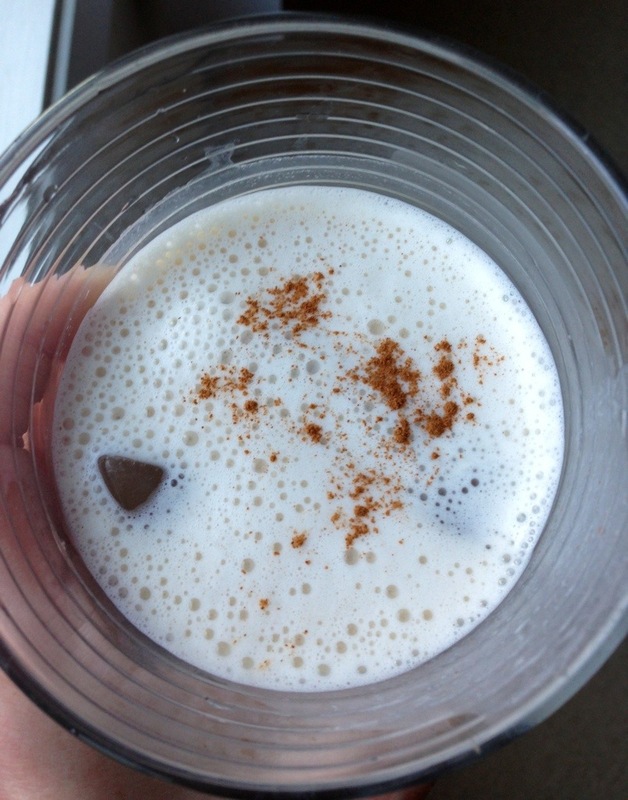 Baby Bird’s Applesauce — Recipe for the youngest of babes, 6 months old and up. Raw Energy Bites — Includes tactile fun and licking sticky hands. What do your kids like to make?? Please share in the comments. Links are fine. Did you not get enough turkey yesterday? Or do you have too many leftovers and are looking for tasty ways to use them? 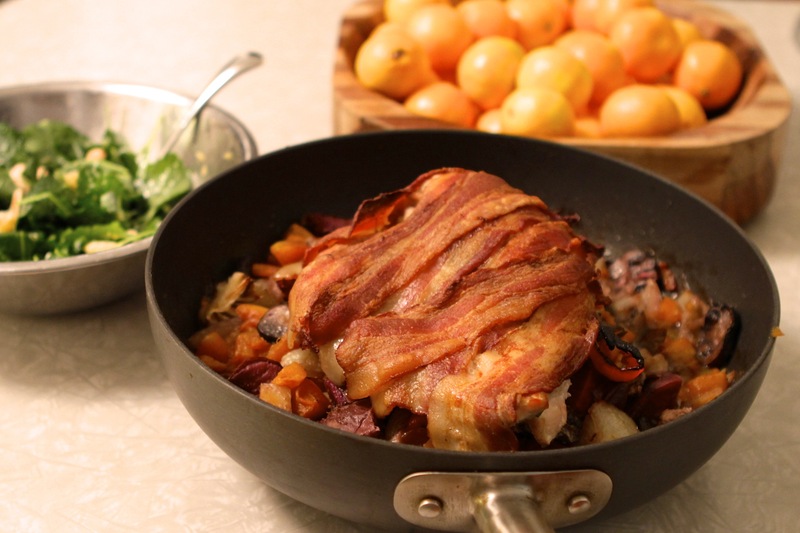 This recipe features many of the flavors of Thanksgiving in a one dish meal. And part two of the recipe is a hash — a perfect way to make a second night’s meal, or to use extra Thanksgiving leftovers. We didn’t cook the whole feast ourselves yesterday but joined a large, extended family gathering. I brought pies. The hosts are great cooks and so gracious that they actually send every guest home with a large to go container of leftovers. Still, I couldn’t wait for the tastes of Thanksgiving last weekend. I also make this recipe with chicken, but the chicken just didn’t look as good in the store as the half split turkey breast. Normally I wrap chicken breast in prosciutto or stuff the turkey with a mix of pancetta and fresh herbs, but this time I had bacon at home. To be perfectly honest, we preferred the taste of the prosciutto over the bacon. Any of them will work for adding moisture and flavor, so use what you like! Similarly, any number of vegetables will work. Use whatever you have on hand. Winter root vegetables are particular well suited to the dish and mushrooms add a lot umami. Preheat oven to 400° F. Add oil to a large oven proof skillet, pan, dutch oven or baking dish. Chop the vegetables into chunks (slightly larger than bite-sized as they will shrink down) and add them to the pan. Sprinkle with pepper and cayenne (salt is optional since the bacon/prosciutto is salty). Stir so that all are coated with a little bit of oil, and add a little more oil if needed. Sprinkle pepper and fresh herbs on the turkey breast. Wrap with slices of prosciutto and bacon so that just the top is covered. Place on top of the vegetables. Toss any extra herbs in with the vegetables. Roast in the oven until the meat reaches an internal temperature of 165° F. (I remove it just before then as I find the temperature continues to rise slightly.) Move the meat to a serving dish. If the veggies need more time, throw them back into the oven. If they are near done, add the sherry, marsala or wine, and stir. Place back in the oven for 3-5 minutes. (This can also be done on top of the stove, if using a skillet or dutch oven.) Using a spatula or wooden spoon, scrape up the caramelized bits, stir and serve. If you are using chicken it will be definitely be done before the vegetables. So either cook them alone a little before adding the meat, after, or both. 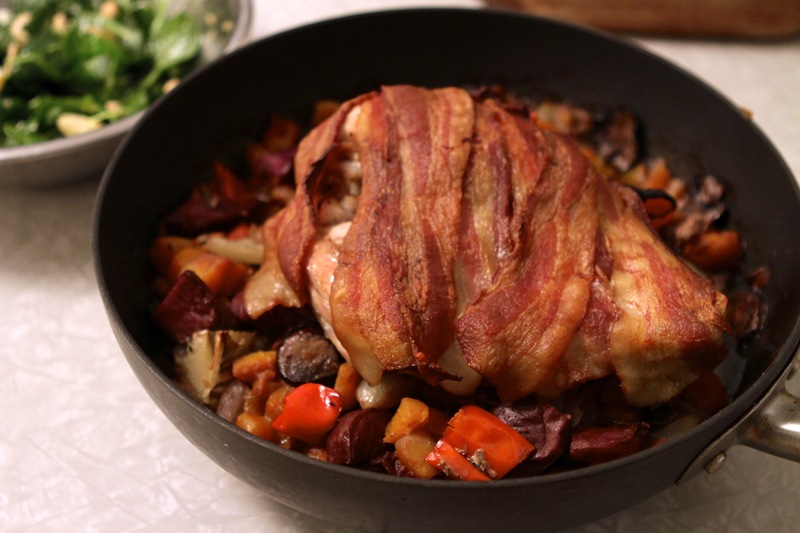 For a nice variation, stuff the turkey with pancetta and herbs instead of wrapping. Make a slice length-wise down the breast and stuff. For a true taste of Thanksgiving, use sage, among other herbs. I try to avoid eating sage while breastfeeding, however, since it can reduce milk production. This is easily a one dish meal, but this time I served it with my favorite green salad of late: baby kale, citrus, fennel and feta. 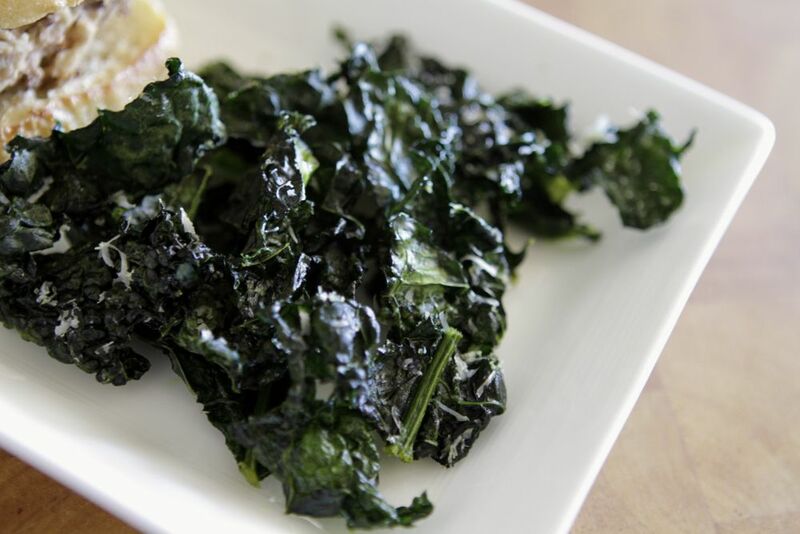 In a large pan heat any fat that has congealed in the leftovers. If needed, add a little oil. Remove the bacon (if any) from the meat and chop finely. Add to the pan. Remove the meat from the bone and cut into bite-sized chunks. Add the meat and vegetables to the pan. Add the eggs. Stir occasionally, like scrambled eggs, until the eggs are done and the other ingredients are heated though. No seasoning is usually needed since the leftovers are seasoned. Can be served with hot sauce and/or ketchup.